Bro Mark, shivering in St. Louis, sent me this picture and message this morning. The iPhone doesn’t do so well in low light. This truck was in the Galleria Shopping Mall parking lot last night. I stopped and asked the driver if I could take a picture of his truck. He was from the south and was very nice. Said he just wanted to be sure that Santa saw him this year. The inside of the truck was lit up with just as many lights. He was going to wait out the snow/ice storm that was heading our way and the snow up north that had the roads shut down. The photos that I took from the side turned out too blurry to even send. If I saw this rolling down the highway, I would HAVE to follow it, I would just have to. There are some folks who swear that I have almost as many lights on my bike, but I’ll deny it. I wish I did, but I have to confess that I’m a few bulbs short of a string. In a comment below, Bro Mark walks down memory lane. 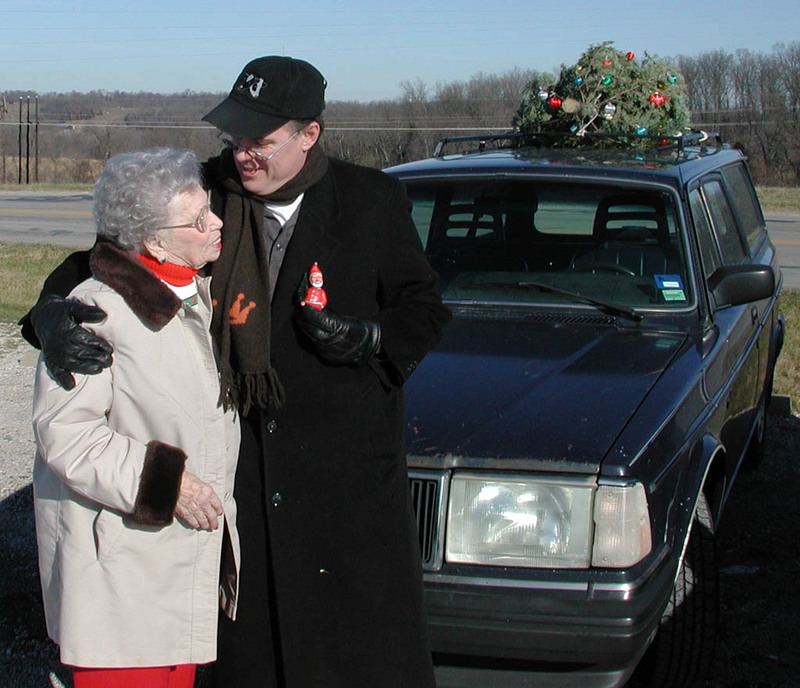 I had a great old blue Volvo station wagon a few years back and I would take an artificial tree and lay it down on the roof rack and then decorate the tree. I wired ornaments to the branches so they wouldn’t fly off as I drove down the road. It also had a full set of lights strung on it as well. I powered the lights off a converter that plugged into a lighter. It was great fun to drive down the highway at dusk and as I would approach a van that had kids in it, I would throw the switch and light the tree. You’d never guess that kids noses could flatten out so wide against a car window. I always got the thumbs up from other drivers as I drove down the road. Ken may have a photo of the tree since the car broke down one Christmas on the way home when he was visiting here. It would be unlike him to have NOT taken pictures. Later I learned that I was an idiot for using regular lights. Apparently there was some risk of electrocuting myself with the standard 110 volt lights. Electrocution, schmuckticution…I might have to do it again with the new car next year, because it was so much fun. [Ed Note: For the record, it really DID look cool at night. As far as learning that he was an idiot for using AC power to light up the tree, the Idiot Train pulled out of the station a long time ago. If you don’t believe that, check out one of Bro Mark’s other escapades. Seems like he has this thing about lifting his bike up in the air, probably to demonstrate how light it is. 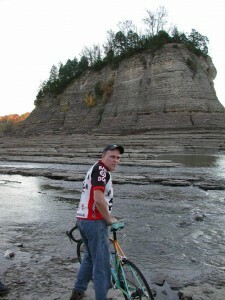 After a ride, we decided to check out Tower Rock, which is normally surrounded by swift-moving Mississippi River waters. Because of a drought, it was possible to walk out to the rock for the first time in years. Let the pictures speak for themselves. Click on the thumbnail to see the whole story. Bulb for bulb, he’s likely got you beat. For brightness — nah! You blind me from both front AND back. Wondering if all that light doesn’t bother him driving. Wonder, too, if his lights run off a generator or what? I don’t care what it takes to get noticed, as long as it works. OK, I draw the line at the orange Speedo. You have to have SOME sense of propriety. 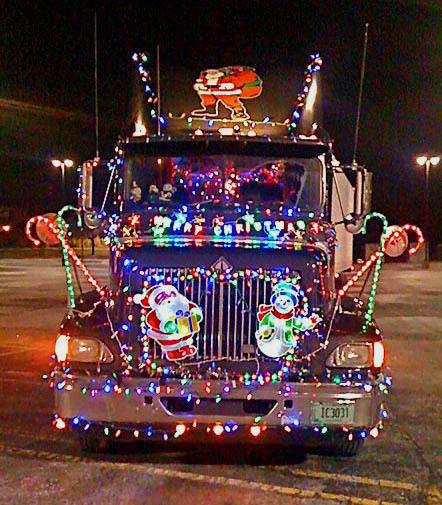 I imagine the trucker kills the interior lights when he’s driving. As far as a power source, his lights are probably either 12-volt DC and run off his battery or he has an DC to AC power inverter. Unlike me, he doesn’t have to pedal to produce his power. I had a great old blue Volvo station wagon a few years back and I would take an artificial tree and lay it down on the roof rack and then decorate the tree. I wired ornaments to the branches so they wouldn’t fly off as I drove down the road. It also had a full set of lights strung on it as well. I powered the lights off a converter that plugged into a lighter. It was great fun to drive down the highway at dusk and as I would approach a van that had kids in it, I would throw the switch and light the tree. You’d never guess that kids noses could flatten out so wide against a car window. I always got the thumbs up from other drivers as I drove down the road. Ken may have a photo of the tree since the car broke down one Christmas on the way home when he was visiting here. It would be unlike him to have NOT taken pictures. Later I learned that I was an idiot for using regular lights. Apparently there was some risk of electrocuting myself with the standard 110 volt lights. Electrocution, schmuckticution…I might have to do it again with the new car next year, because it was so much fun. How come you don’t have any pictures of the Volvo at night so you could see the lights all bright and lit up? The Volvo is probably still sitting at the garage waiting for Mark to pick it back up. Next time You’re in Missouri, you should drive by and see if you can still turn the lights on. The lights weren’t on in my pix because (A) it was daylighnt, (B) the engine was blown, so it wasn’t putting out power to the lights and (C) if we HAD been able to run the engine there would have been so much smoke you couldn’t have seen the car nor the tree. The Volvo sat there for at least a year until Mark made a deal with the station owner to take it off his hands. You’ll have to ask your uncle in which direction any money may have moved in that transaction.